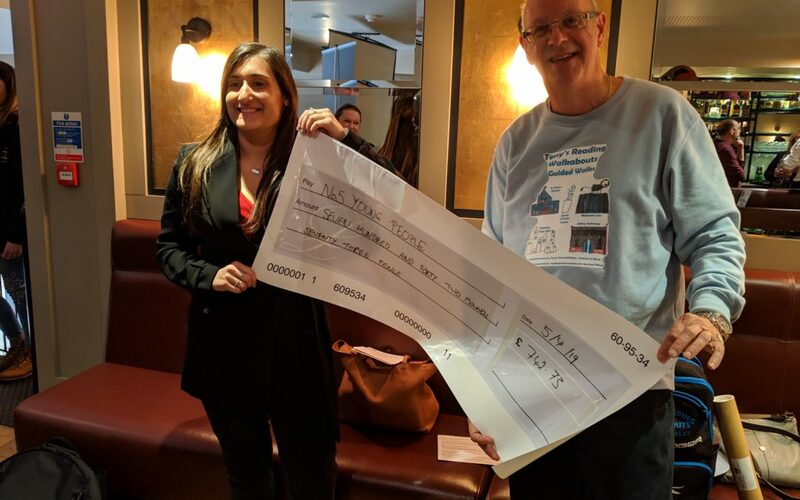 We want to say a huge ‘thank you’ to Terry Dixon from Terry’s Reading Walkabouts who chose No5 as one of his two chosen charities and has been fundraising for us over the last year! Terry has raised an incredible £742.73 and we are delighted to say that this amazing amount will pay for 37 Early Response sessions for under 17 year olds! Our Early Response Programme was piloted in 2017 to address the growing demand for our service and we have had a fantastic response from these sessions with young people telling us that their Early Response session ‘allowed them to experience what counselling at No5 is like early on’, ‘provided them a chance to alleviate their fears and anxieties about counselling’, ‘made them feel cared about, heard’ and that their experiences were ‘valid and important’. Our Early Response Programme can help improve a young person’s wellbeing as they can share some of their worries in that initial session, which helps them feel as though they are not carrying their issues alone. Thank you, Terry, for all that you have done for No5 this year and the incredible amount of money you have raised!